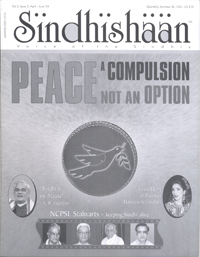 The Jan-March issue of Sindhishaan has touched under the column of “Random Quotes” an important subject of world citizenship which for a Sindhi relates to our civilization and awareness. The thoughts are expressed by retired Prof. of psychology, Mrs. Sabita Babani. Such thoughts are most likely creeping into the minds of young generation of Sindhis. 1. Why is the Sindhi community obsessed with the idea of Sindhiat and Sindhology? 2. For those who were born in Sindh, it may be a very interesting exercise, but we must rise above that and think in terms of an Indian or even further, a world citizen. 3. Today the world is marching towards a world village, the Sindhis, who have already lost “Sindh” perhaps may lose world citizenship, if they get involved with thoughts of Sindhiat and Sindhology. This may be the mind set within some sections of the community, but if the feebleness of this thought is exposed before the youth of today, they will get a correct direction and perspective. The idea of these discussions is not to split hair or downgrade someone but to achieve a correct perspective for the Sindhis. The first thing is that globalisation has got nothing to do with world brotherhood or world citizenship. It is an economic system in the same way as socialism, capitalism, Gandhism, etc. Those “isms” concern mainly economic systems/structures. They appeared for a short while and then disappeared. The economic patterns keep on changing. The industrial revolution ushered the system of Capitalism, which gave birth to Socialism and Communism. Even the idea of Gandhian Socialism has eroded and become weakened. Therefore for Sindhi youth going in for globalisation and world citizenship to abandon Sindhism is an absurd proposition. On the contrary he will be able to command more respect by maintaining his national or social identity. The Sindhi has from times immemorial remained “Sufi” and believer of world brotherhood. In the globe he has imbibed a noble stature derived from his civilization of river Indus, one of the greatest civilizations of the world. The other thought that the Sindhi, because of Sindhiat and Sindhology will be bereft of a global atmosphere, is also incorrect. Even today Sindhis are engaged in trade with foreign countries as has been for over 2600 years. Though they hold Indian passports, they are known as “Sindhi Vaparis” with respect. Every world citizen is known for his art, culture and civilization. Every society has its peculiarities and ethos. The Indian society is broader in its outlook. We are not narrow- minded. We are more tolerant. As for the question of teaching world values to Sindhi, we can claim that these values have been with us for over 2500 years. We are much forward in several values than many countries. Our thought and general behaviour can be well compared to any people in the world. If our child is deprived of the new trend in global thought and behaviour, he will remain backward, which we would never like. We have to accept and adopt new values. We do not want to remain stagnant and will accept every change that will be for the betterment of our society. However this does not mean that we discard our history, culture, unique identity – Sindhiat.